When canning our homegrown produce, we want the best quality ingredients. 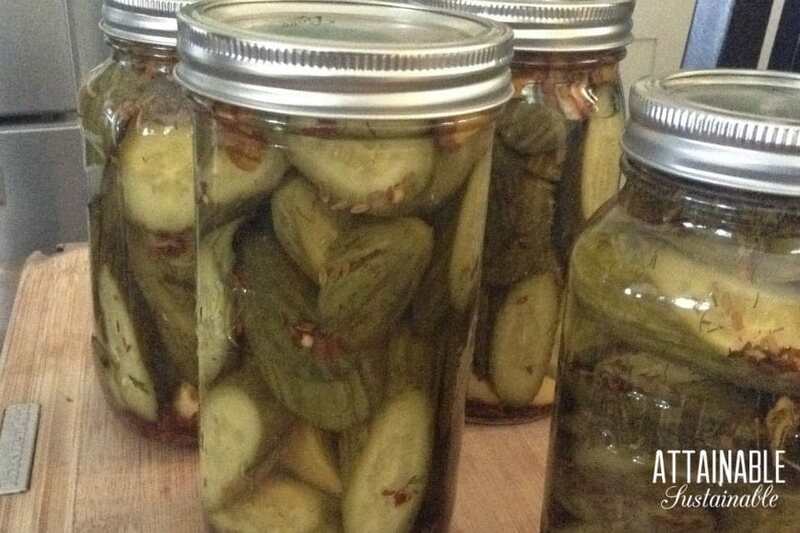 Your go-to brand might not be the best vinegar for pickling and canning. Ready why and how to choose the best vinegar for your recipe below. Truly, is nothing sacred? If you’ve been grabbing the same vinegar off the shelf for years, not giving it a second thought, it’s time to do a little label reading. Surely a product with the words “apple cider” on the label would be made from…apple cider, right? Think again. Depending on your brand, that jug may contain ‘apple cider flavored‘ vinegar. Sun-ripened grain. That sounds nice, doesn’t it? But the picture that accompanies that statement shows an ear of corn. And you can bet that corn is transgenically modified. Now, this may not change your buying habits at all. You might not be concerned about the idea of using potentially genetically modified ingredients in your canning. 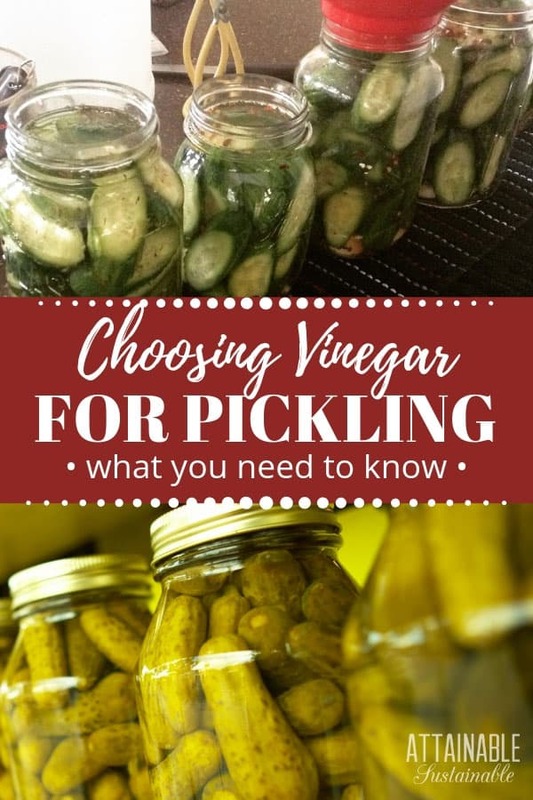 If you are, though, here’s what you need to know about choosing vinegar for pickling and canning recipes. Vinegar is commonly used for pickling vegetables. The most critical thing to know about choosing vinegar for pickling is this: Choose a vinegar with an acetic acid value of 5%. This should be stated on the label. If you don’t know the acidity of the vinegar, don’t use it. Different types of vinegar impart a different flavor and color to recipes. White distilled vinegar is commonly used in pickling. It’s got a fairly neutral flavor as vinegars go. It’s made by fermenting grains, as stated above. If you prefer to avoid potential GMO ingredients, Spectrum makes a white distilled vinegar that’s labeled as non-GMO. Apple cider vinegar is made by fermenting apple juice. Its flavor is a bit more fruity than white distilled vinegar. This filtered apple cider vinegar is labeled as non-GMO as well. You can exchange either of these vinegars in pickling or canning recipes, as long as the acetic acid value is the same. 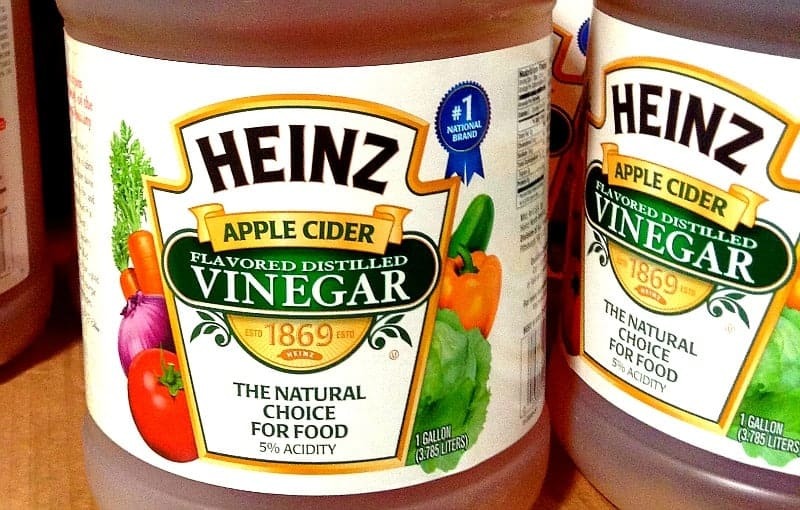 So Heinz has two different apple cider vinegar products; one sourced from apples, the other sourced from corn and flavored to taste like apple cider vinegar. From what I’ve seen, the smaller glass containers are the true product, while the gallon size jugs are the “flavored” versions. 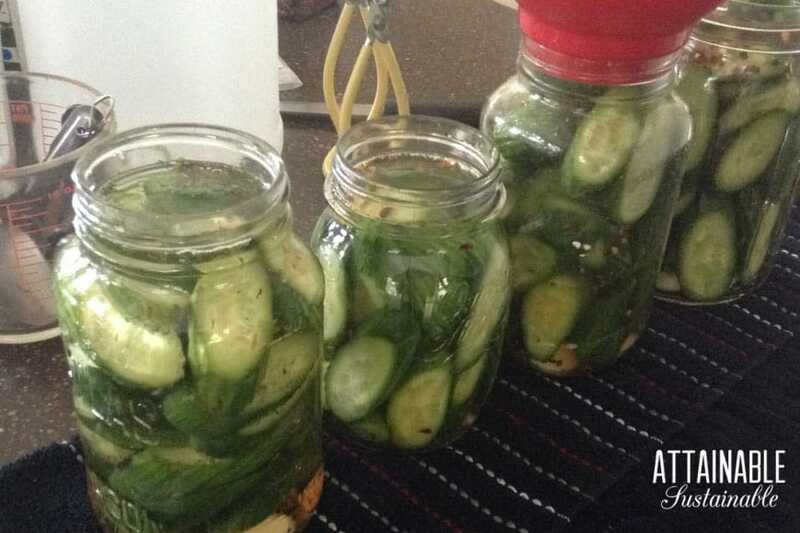 If you’re a home canner planning on pickling, odds are good that you’re reaching for the more economical jug of vinegar without giving it a second thought. I better start reading all labels from now on… I read for other products but had never thought to check on the apple cider vinegar. Thanks for this alert, Kris! @SoniaR I KNOW! I discovered that the white vinegar is no longer white *wine vinegar some time back, but just spotted this apple cider bait-and-switch a couple of days ago. It’s crazy! Hi, my family including my self has just used the plain white distilled vinegar for making pickles forever, even my great grandmother. I have never seen anybody use apple cider vinegar for pickles or ever tasted any made that way. Wouldn’t it completely change the flavor so the pickles would not taste like traditional pickles and in my opinion probably not taste good. I use organic apple cider vinegar in some things but I can’t imagine it being used for pickling. 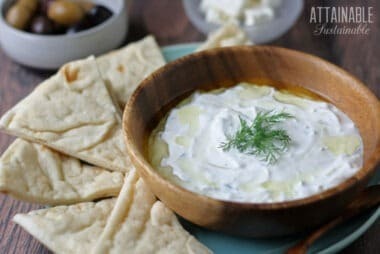 Where can I find a good recipe to try? I discovered the apple cider “flavored” vinegar a couple of years ago when preparing to make pickles. I found only one brand in the grocery stores that was really apple cider vinegar. Of course, it can be found in health food stores and coops. I had not thought through the white vinegar issue though. We use white vinegar primarily for cleaning, yet it is still perpetuating the GMO issue. Thanks for the info. Oh, for pete’s sake. I just checked my Whole Foods 365 brand apple cider vinegar, and it clearly states that it’s certified organic and that the company’s private label products follow the US law that forbids any GMOs in organic foods. So go organic with your vinegar, guys! White wine vinegar and white (clear) vinegar are two very different things. Heinz doesn’t make a white wine vinegar anymore. And as for their white vinegar, all white non-wine vinegars are made from distilled corn alcohol. I agree that the apple cider-flavored is a bit odd, but as for the white, this is how all white (again, non-white wine) vinegars are made. You are getting the two mixed up. Whether they are GMO or not is a different piece of the puzzle. I don’t think I’m getting the two mixed up at all. I understand that they’re two different products, but these products have changed over the years. Used to be I could pick up a bottle of Heinz that was a clear liquid and it would be white WINE vinegar. No more. Heinz no longer offers white wine vinegar according to their website; it’s all distilled white vinegar. The do have RED wine vinegar: http://www.heinzvinegar.com/products-red-wine-vinegar.aspx. The apple cider vinegar change hasn’t made it to their website yet, but based on the image above, clearly they’re making changes to their recipe. In either case, if you’ve been buying the same brand for years, thinking that you know what you’re getting, you need to pay attention to the label. Things, they are a-changin. Again, 2 separate products that you are discussing, white”wine” vinegar and reg. white vinegar. Regardless, if they discontinued the white wine, as mentioned earlier, 2 very different products with many different uses. Cripes. We like Dr. Bragg’s apple cider vinegar, which I’m hoping is ok, but I’ll go read the ingredients. @Jane Boursaw We like and use Bragg’s, too, Jane. Not cheap for cleaning, though! I, too, use Braggs. But they do say it has “The Mother”, but I noted that it only has sediment at the bottom, usual for non pasteurized, but no visible scoby, or stringy bits that form the “Mother”. So….are we getting the actual “Mother”??? I do wonder. I contacted them and asked this question months ago when I noted it, but have yet to get an answer. Maybe that IS my answer??? Well, the really stupid thing about Hienz is the advertising of the grain being “sun ripened” LOL. Isn’t ALL grain sun ripened? It’s not like a tomato that can be picked green and gassed to make it red! How dumb to they really think we are? Since I use white vinegar mostly for cleaning, I’m not too worried about it being made from GMO corn, although I would like that type of product to go away in general. I don’t think my laundry really cares if the vinegar is GMO or non GMO. I have been trying to tell myself the same. But does it leave a residue that would enter our systems through the skin. Makes me crazy! Though I don’t think GMO matters for cleaning per say, I don’t want to encourage any GMO products so once again, we will have to pay more to get less. Less, chemicals, less bio-engineering, less screwing with mother nature. and as a side note, white vinegar and white wine vinegar are two entirely different things, so we’ve always had to read the label to correctly identify what we were buying, but the apple cider thing kinda ticks me off. Heinz just lost a customer for all it’s products. Actually, grains are not sun-ripened anymore. Wheat products are sprayed with glyphosate (round-up!!) to force them to all ripen at the same time. Makes it easier to harvest. Doesn’t that make your mouth water…. I have never seen evidence that roundup causes ripening time. How could that work using a herbicide to effect ripening? I grew up on a farm and have a minor in chemistry. As a Master Naturalist I study native plants. You should care, if you have any issues with GMO’s at all since your largest organ is your skin. So unless you’re rinsing repeatedly, you risk issues. I make my own laundry soap, don’t use vinegar or bleaches in the laundry yet my husband loves this soap. Better than Tide, Surf, Arm & Hammer or any big brands. And he gets a lot of oils, dirt, grub and nasties on his clothing. Would you post the recipe for soap you make please? Thank you. Oh so glad I live down under where having checked my labels ours is ok, agree about always reading labels though as it is interesting what can end up in our foods! First off, I have to say that corn is a grain so I’m not sure what you take exception with about corn. As a farmer’s wife, I can tell you that MANY farmers use a chemical dessicant to ripen their crops. Chemical dessicant basically kills the plant and forces it to mature instead of waiting for nature to ripen it. There are many reasons why dessicants are used, mostly to make harvest happen in a timely manner so that crops are not ruined by frost. So no, not all grain is sun ripened, especially commercially grown crops. @Allison TrebleThanks for weighing in and telling us about the dessicant – is that used on corn, too? I had no idea. Personally, I love corn. 😉 What I DISlike is genetic modification of crops, and an awful lot of corn is GMO. Yes, a dessicant called Reglone is very commonly used on crops such as canola, corn, and field peas along with others I’m sure. Our stomachs cannot digest corn, neither can the animals. Cows are fed through ports of entry into their stomachs, gaping infectious holes. Workers literally stuff cows with corn and grain because cows won’t eat it, don’t like the stuff and the farmer is just pushing the cow towards maturity to slaughter quickly. Look into it. Cows love corn, but it’s not what they should be eating, just like you shouldn’t have candy for every meal. Not true! I raised cows, and they loved the grain I fed them containing corn. Until I discovered that it is not NATURAL for cows to consume corn. Their stomachs ( 4) don’t produce the proper enzymes to digest grains; ANY grains. But they WILL eat it, and very happily, too, I might add! That is misinformation. You need to drive out to a feed lot. Do you really think farmers have time to stuff corn into a 6″ hole in the side of thousands n thousands of cattle? I live in Nebraska where there are a lot of feedlots. That doesn’t happen. Those holes are made for cattle on display so people like you can see how their stomachs work. …. you need to study up on things you comment on b4 you comment! !! @Allison Treble I don’t like the idea of grain in general being use to make apple cider vinegar, it clearly should be made from APPLES! If I wanted vinegar from grain I would buy white vinegar. However, I did read somewhere that some white vinegar is actually made by diluting acetic acid produced by GM bacteria (rather than the tedious process of naturally fermenting the vinegar and then distilling it). Makes me think I should just make my own vinegar so I know where it comes from. @farmer_liz I agree that Apple Cider Vinegar should be made from apples but the article above was talking about White Vinegar being made from corn. Unfortunately, it’s true that you need to make things yourself to know what is in them. Chemical dessicant — herbicide — good reason to buy organic whenever possible. Just checked my Trader Joe’s apple cider vinegar and it just has the good stuff in it. Do you have a Trader Joe’s nearby? Unfortunately Trader Joes brand cider vinegar is pasteurized, .killing all the good stuff you want in there, which makes it benificial – Braggs cider vinegar is alive and very healthy, and it cured my Gout! And yet something else we didn’t know that we need to! Thanks, Kris. I just bought a bottle of store brand white vinegar today. I’m going to go check and see what it says. Ok I buy the hienz white vinegar just for cleaning and laundry puposes…I get my apple cider vinegar from the farmer`s market so no worries therE. I hate GMO`S but does it really matter for cleaning? Yes, because you’ve voted for GMOs and GMO high-chemical farming with your dollars. Health wise it’s not as big of an issue, but over all it is. If we keep continuing to buy products made with GMO’s then they will keep growing them and they will keep showing up where they aren’t supposed to be. Either way, I absolutely hate that we have become a society that has to read labels and research our food so much. It’s supposed to come from nature, not a lab! Yes, it really does matter for cleaning. When you buy products with GMOs in them, you are financially supporting the world’s most evil corporation. If thousands (or millions) of others are doing the same thing, it doesn’t bode well for life on this planet. You guys seem quite generally informed, but as to cleaning, there is more at stake than supporting an evil industry. Surely you know your skin is your body’s largest organ. And that it is very absorbent. So I hope you can see that exposing your skin to things “cleaned” with GM products is not a good plan, even without considering the corporate farming it supports. Just how much vinegar are people consuming if they are so concerned about GMO corn? And if you only clean with it, who cares at all? My bottle last for a year or more. Diane, I believe the reason to care is not about the effectiveness of vinegar for cleaning or how long it lasts, but by purchasing it you are supporting the GMO industry. Tell me braggs is still safe? Braggs is totally safe and organic and the only vinegar I will buy! Egads! I just made dill pickles with “white vinegar”. I didn’t even think about reading the label. I think the thing about using GMO vinegar for cleaning is simply that even if we are not putting it into bodies, we are still supporting the GMO cycle by buying it. I just checked my Market Pantry brand (Target)of Apple Cider Vinegar. Ingredients: Apple cider vinegar, diluted with water. Are the apples organic? NO? Then they are made with Genetically engineered apples. As are all apples NOT marked with the organic label.. The question is: WHAT is the distilled vinegar made from? Apple cider? Or grain? The reference to grain at the end that you were wondering about is a reference to the strength of the acidity. It has nothing to do with a type of grain like wheat or whatnot. E gads…I just got done pickling 40 quarts of garlic dills…saw the *flavored” word on the generic brand so I grabbed the Heinz thinking I would be getting the real thing….should of read the label..won’t happen again!!! Sigh….. I have been using Heintz white vinegar when I dye. I didn’t even think about it being GMO! I guess I’ll have to switch over to organic vinegar for my art. Everything else in my house is either GMO free or organic. Thanks for the ‘heads up’!! Pioneers died at a much earlier age than we do. The problem with generalities is they are too general to mean much. My ancestors were pioneers who lived into their 90’s, and were conscious of how they conducted their lives before it became fashionable. There were “health nuts” at the turn of the 20th century that would have seen GM food coming, and run as fast as they could in the opposite direction. I cannot recall exactly the source, I think it was the founder of the Mother Earth News who said his own father demonstrated the evils of white bread by rolling it into a ball, bouncing it off the hardwood floor, and stating firmly “This is NOT food for human beings”. And that was a long time before it became widely accepted fact as it is today. I have started making my own from the left over scraps of apples from pies and juicing. Mix with water, sugar and a bit of braggs with the mother to give it a boost. Takes some time, but, eventually I will be ACV rich! My answer is simple…..I will never buy Heinz brands again! I encourage you all to do the same…Its Not worth it to be duped into eating poison! GMOs are poison as proven by multitudes of tests that have been hidden from the American public. 62 countries already require GMOs to be labeled. Do they take us for fools or what? I buy European vinegar now at 3 times the price unfortunately, but its still true to tradition. I am intrigued, as I do know generally European food is of much higher quality. Can you expound on this a little? Are there specific advantages over, say, Bragg’s unpasteurized organic vinegar? Just found this post after another friend pointed out the fake cider vinegar.. They maker a fake apple cider vinegar for a reason… It isn’t a conspiracy to defraud the consumers.,…. My wife’s Boss (among many other people) happens to be allergic to Apples and apple products… She has to use the “Fake” stuff for HER cooking. It IS a profit thing. Your friend just happens to benefit due to an allergy. Heinz also makes an all-natural, unfiltered, raw, unpasteurized apple cider vinegar with the “mother” that’s made of apples and water. Read your labels! Where? What is it called. I have NEVER seen such a product in ANY store I frequent. Also, WHY support a company that makes something similar when MOST of their products are clearly GMO. They don’t care about organic, they just want some business from REAL organic loving, healthy, and TRUE organic people and farmers. DON’T support them!! Support local, ORGANIC ALL THE TIME farms and companies that truly CARE. It is labeled Heinz Vinegar Apple Cider Unfiltered All Natural. 32 oz. is 5.78 at Walmart. It contains the mother. I usually buy Braggs, but have this on my comparison chart. They DO make apple cider vinegar – as I stated above. But they also make apple cider *flavored vinegar. You have to read the label to be sure that you’re getting the one you want. How do you know the corn used in Heinz White Vinegar is genetically modified?? Heinz also sells a raw, unfilitered apple cider vinegar with the mother. I don’t think my floor or laundry really care where the white vinegar came from. For human or animal consumption we use Bragg’s. Yes, I think that’s true. It’s a double-edged sword, though. Buying the GMO vinegar for household jobs supports the whole GMO business. And yet, who’s gonna pay for Bragg’s to clean the floor? 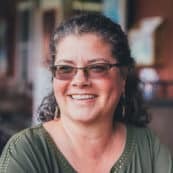 I experimented awhile back with making my own vinegar from citrus scraps — https://www.attainable-sustainable.net/tangerine-vinegar/. Very interesting, thank you for the tangerine vinegar link. And while I am dubious about washing clothes with GM products, I don’t suppose the risk from mopping floors is very high, and as far as supporting the industry, my local supermarket sells a gallon of cheap white unbranded and presumably GM white vinegar for two bucks, so at least they are not making much from my limited support. But I will try making my own, to reduce “not much” risk/support to zero of either. Thanks again. The best thing to do is brew your own hard apple cider and make your own apple cider vinegar. I’m glad I live in Australia. Ok, so I literally just read my small glass jar of Heinz white vinegar and realized it is most likely made from GMO corn. Ugh! What non gmo vinegar options are there? Bragg’s apple cider vinegar. Colavita brand has lost of actual wine vinegar options. There’s one that comes in a round bottle with a straight neck (can’t recall the brand). And lots of gourmet vinegars. And this year at a favorite produce market, they were selling another brand that was only 4% acidity instead of 5%. There are sure to be some angry picklers over that! It always pays to read the label! Yes, good article. Personally I only go for Organic ACV with the all important ‘mother’ in it for all the goodness. Easily fixed…make your own apple cider vinegar! Either let your apple juice (hopefully Organic) mind it’s own business in a dark place for a month, or slice up some apples and let them sit in some non-chlorinated H2O for the same amount of time. 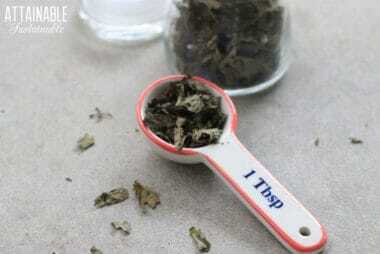 Decant the fluid into a jug: presto! Apple Cider Vinegar! Save the gluck that was floating at the top…this is the “mother”, a clump of yeast that you can use to make your next batch! THANKS FOR THE INFO!…NEVER NOTICED THE DIFFERENCE BEFORE! I bought my first gallon of Apple Cidar Vinegar to make pickles . I will check the label now…I expect it to be what it is named ! Thank you for the information.